Description: The Middle Ages were a vibrant time when theologians, priests, and poets searched the writings of the Apostle Paul for guidance and inspiration. In this volume, scholars examine the academic influence of Paul on thinkers like Peter Abelard, who understands him as the original "master of theology" and develops his own ideas of Christ's atonement as the Passion of God; Saint Thomas Aquinas, who transforms the apostle into an imitator of Christ for all to emulate; and Dante Alighieri, who barely mentions the Apostle in the Divine Comedy but invokes him constantly as an "absent presence" throughout, providing a powerful rhetorical model for Dante's own voice. This book provides a perspective on the variety and flourishing of thought in the centuries leading up the Reformation. 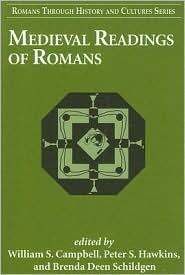 Citation: Francis Dalrymple-Hamilton, review of William S. Campbell, Peter S. Hawkins, and Brenda Deen Schildgen, eds., Medieval Readings of Romans, Review of Biblical Literature [http://www.bookreviews.org] (2009).